Most of us know that we have everything we could possibly need or crave for available in India — even if we do tend to go overboard when we encounter the sights and delights of Dubai and other shoppers’ paradises. Aren’t there times when we picked up something we thought was rare and beautiful from the shelves in stores halfway around the globe — and then found the same thing right down the street from our home? And haven’t we frequently flipped through clothes in other parts of the world and seen the telltale ‘Made in India’ label tucked away somewhere — and despite those labels and the knowledge that we can find the same thing in our backyard, don’t we still go ahead and buy what catches our eye, because we are pretty certain we will not come across that particular piece or that very captivating colour even if we do take the trouble to go rummaging in our Indian markets? Those of us who travel abroad also fixate on certain things that we get only in certain places — and thus we have headed to IKEA stores wherever we came across them. 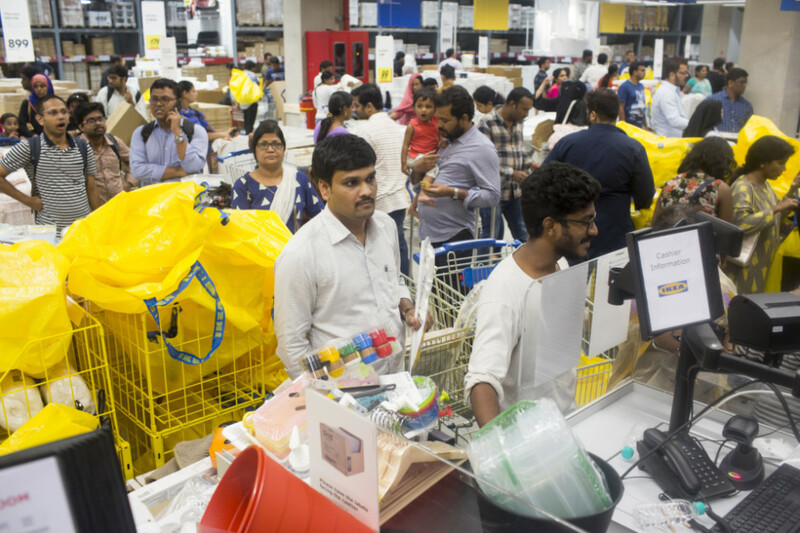 Having had our thrills at IKEA in the UAE and elsewhere, where, naturally, we could only pick up small and lightweight items that did not exceed our baggage allowance, we have now been treated to the best of all: IKEA in India! At last we can let ourselves go, unleash the shopaholic in ourselves, replace all our ageing and wilting kitchen and bathroom and bedroom ware and maybe even some of those chairs and tables and cupboards that have seen better days. We can start a new life altogether — or so we think! The media has been most helpful as well, and as we go for our morning walk, we discuss the latest announcements our companions have received, then come home to pore over a full-page advertisement in the newspaper that holds appeal for the child, the adult, the senior citizen — and in our case, for the combination of all three that exists within us. The prospect of indulging in Swedish meatballs a la Indian style is pondered over because so far that is all that we are sure we will look for on the menu at the furniture store’s eatery — and we will surely be hungry after all that tramping to and fro as we make up our minds about what to put into our shopping cart. Then, the media cover of the first week makes us consider cancelling our plans for, in true Indian style, the novelty of the place has translated into jostling crowds, traffic snarls and parking woes and what we anticipated as a leisurely shopping trip in our “backyard”, so to speak, does not seem likely. But we too are cut from the same cloth as the rest of our Indian countrymen and women. We too want to indulge ourselves before the novelty wears off. So, we too are there in the first few days and crowds and a little jostling notwithstanding, we too have the time of our lives!